Third-round defensive tackle Justin Jones is also under contract, leaving James as the sole holdout. NFL rookie deals are now a breeze to negotiate thanks to the league’s most recent collective bargaining agreement, but James will likely sign his deal soon. 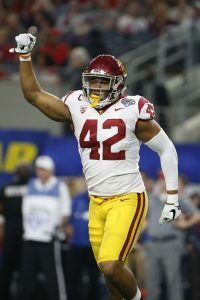 First-rounders are often able to push for certain contractual issues, such as timing of bonus payments, but James is participating in the Chargers’ rookie minicamp even without a pact. Most of the players signed by Los Angeles today will likely need to make their rookie mark on special teams duty, but Nwosu could have a chance at playing time in 2018. Although largely an edge rusher at USC, Nwosu probably won’t see much time as a pass-rusher given that the Chargers already employ Joey Bosa and Melvin Ingram. But the 6’2″, 240-pounder could find a role as a inside ‘backer, an area of weakness for the Bolts.